All children should be inspired by music and every student has the right to an outstanding music education. We aim for children to develop a love of music, developing essential musical skills, knowledge and understanding. We are also passionate about the power of music and the impact it can have on a person’s emotional, social, personal development and well-being. All children in the school receive weekly music lessons with a specialist teacher. Our curriculum, which follows the guidelines of the National Curriculum, aims to give children the opportunity to develop performance, composition and listening skills through exploring a variety of musical styles, traditions and genres and by taking part in a wide range of activities. Every year, each year group has an opportunity to perform ‘on stage’ to a wider audience: children in Reception, Year 1 and Year 2 perform in a Nativity; children in Year 3 and Year 4 in an Easter production; Year 5 and Year 6 perform end of the year production. Many of our talented children learn an instrument through school. We offer group or individual lessons provided by external music teachers in piano/keyboard, singing, violin, drums, guitar and saxophone. There are KS1 and KS2 choirs for invited children. 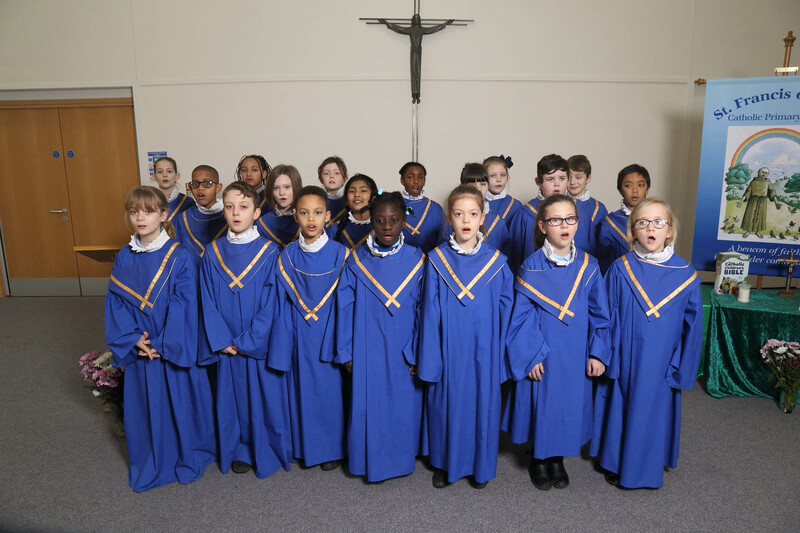 Members of choirs perform at events both in school and in the wider community, often take part in music festivals and competitions. All children in KS2 are welcome to join a singing club where there are no auditions, all that is required is a love for singing and dedication. The following link will give you information about the Music National Curriculum and expectations in Key Stage one and Key Stage two. Maja: We made the song up because whoever gets bullied should never give up and should stand up for themselves. Chelsy: With Mr Szymczyk’s help we have made a new song and we were very proud to sing it in front of everyone on Friday’s celebration assembly.